It’s dark at what feels like 3pm now, our radiators are whistling, and our skin needs extra love. 'Tis the season for dryness, redness, flakiness, and general nastiness so we’re gonna chat about what's helping us out right now. We’ve got hydrators and exfoliators that work overtime and a few facial treatments that are preserving our collective glow. Read on and don’t forget to drink your water, Thiccies! I don’t know about you but the last thing I want in the winter is a sudsy cleanser to strip away my precious oils. This cream cleanser from Ole leaves the skin soft and supple not tight and itchy. If you don’t have a hyaluronic acid serum of some kind in your winter regimen…. are you ok, sis? Literally WYD? Your skin will drink up this Osea one, and if you start with a hydrating mist like this, the HA will absorb better. Also the mist is a great lil mid-day pick-me-up. These radiance pads are a great way to gently exfoliate without overdoing it, they’re packed with AHAs. 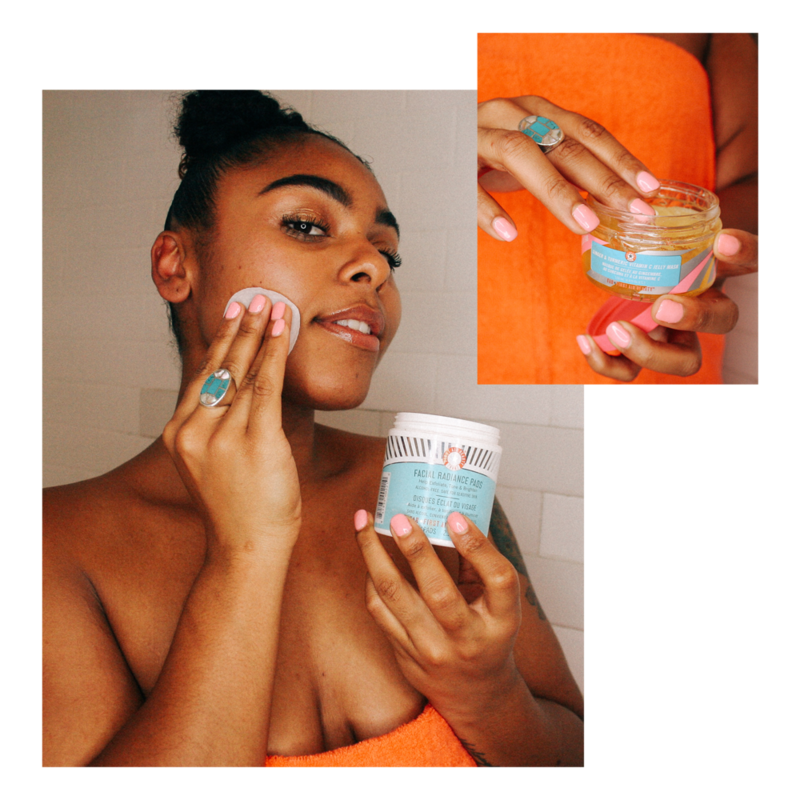 And if you wanna hit em’ with the ol one two punch… the Jelly mask is a great brightening, revitalizing situation that we recommend putting on in the shower before a night out. A heavier duty exfoliation with a high percentage of Glycolic Acid for the days when you really need to shed your sad flaky winter face. We love Erase Spa and especially Aline who performed the incredibly rejuvenating Silk Peel. It’s great for dehydrated skin especially (which is absolutely what I have right now) and uses non-invasive exfoliation and a “dermal infusion” technique that infuses the skin with oxygen. It felt extremely effective but without the post facial redness and irritation I sometimes get, all in all, we stan. If you’re in NY and have 15 minutes (and want a delicious CBD infused latte anyway and maybe to pick up some cute skincare/supplements too) pop into newly-opened Clean Market for a cryo facial which is literally cryogenic therapy for your face. My pores felt tighter, I was told I looked glow-y and I was still in a post-migraine hangover and it felt *amazing*. I’ve used the same cleanser for years, so it takes a lot to make me convert. This cleanser and toner duo is the perfect thing for my winter skin. The combination of almond and sage oils with honey and soap will leave your skin hydrated without feeling greasy--it’s called “recharge” for a reason, thiccies. The toner does an amazing job at wiping away any excess buildup while still leaving the skin soft. I’m no stranger to oils, so my rule of thumb is to use products I can see through (they’re typically water-based). This moisturizer is a serious exception! Much like those see-thru moisturizers, this cream is super hydrating without feeling heavy or sticky. It’s good without a serum, and GREAT with one - it locks in the magic of vitamin c and hyaluronic acid beautifully. This is a perfect for any oily chick tryna look like a lil glazed donut without having your makeup slide off your face! So I just discovered HB, and she’s absolutely IT, chief! Having “clean” (harmful chemical free) skincare is becoming increasingly important to me since I’m not giving up my not-so-clean makeup anytime soon. Herbivore is synthetic-free and loaded with active, natural ingredients, and it shows! This face creme includes rosewater, aloe water, white tea extract, and kukui oil. It’s a tad creamy for oily or combo skin, but definitely a staple in the night routine or makeup-free daily routine. I noticed that it’s buildable, so you can use just a touch and get a nice makeup primer, or load it on for total skin recovery overnight. I’ve never been so glowy and dewy. My skin is truly a light source after starting to use this - the sun is quaking. This serum is quite water-filled so don’t let the “oil” scare you. The consistency is much like a slightly runny lotion to me, and while the product says it’s not suitable for oily skin, I found the product to be quite unimposing, and fresh in both feeling and scent. Long-term effectiveness is still TBD, but this serum is overall pleasant and contains zero hazardous ingredients so she’ll maintain her spot on the skincare shelf.